Unlike other attention-grabbing equipment in the kitchen, a sink more often than not falls back into the background and fails to impress. And as a result, its immense importance in our daily lives is often overlooked. It is rare for a sink to attract attention, and even rarer for it to make a bold statement and act as a centerpiece to your kitchen. And if you are looking for one such sink that will liven up your kitchen space, then we have just the right one for you. The Elkay Schock boasts features that are not only attractive but amazingly versatile as well and is bound to put a smile on any homeowner’s face. And today with our review we hope that we are able to bring across its fantastic qualities. 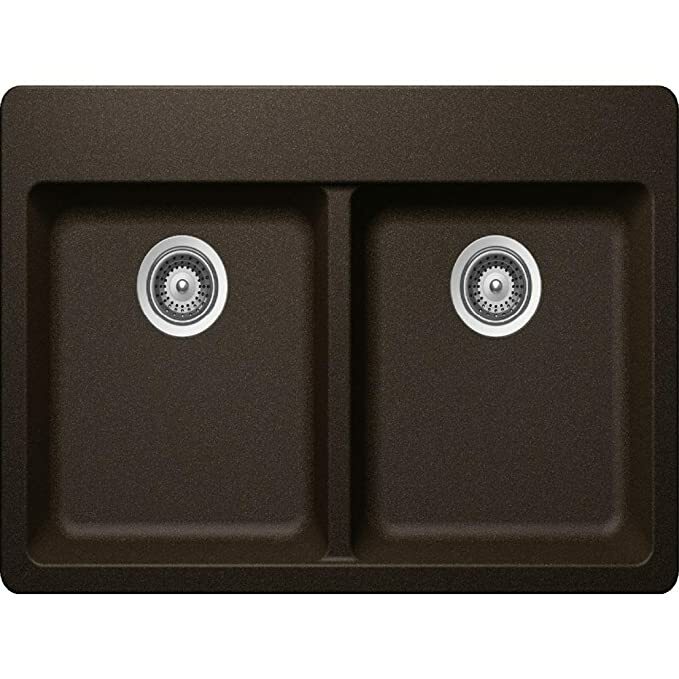 Elkay Schock Sink Reviews 2019: How does it give one of the best kitchen sink experience? What does the Elkay Schock lose out on? The Elkay Schock is all about durability and superior strength, and needless to say, all its specialties lie in the finer details. Using a proprietary manufacturing process, the sink is made up of a combination of natural quartz and high-performance, UV-stable acrylic resins. This not only results in a more rugged build that withstands the toughest kitchen tasks but keeps the colors strikingly vibrant and crisp as well. Let’s go over some of the significant highlighting features that genuinely puts it a peg above the competition. The Elkay Schock comes with a versatile range of customizable options. And along with its unique design, it allows the user to either install it as a drop-in or an undermount, depending on his/her preferences. Most local sinks are equipped with uneven bowl distribution (like 70/30, 60/40), but that is not the case with the Elkay Schock, as its double bowls are equal in size. Now you can conveniently use the bowls independently for washing, soaking, rinsing, drying and other household tasks. As we have mentioned before, Elkay specializes in a quartz built. And together with the high-performance, UV-stable acrylic resins, it makes for one of the most durable sinks available in the market. The addition of organic fibers to the coating offers a higher resistance to impact and physical damage. The most used work zone is reinforced as well with the help of a fiberglass mat that is molded onto the underside of the sink. And for a long lasting, non-fade touch, the Elkay Schock’s vibrant range of colors won’t give away easily. Moreover, it is easy to clean with just the help of a damp cloth and soapy water. On top of that, it is heat safe up to 535 °F. The quartz material is nonporous and incredibly smooth to the touch. This allows the sink to effectively repel dirt, food, liquid, and stains as well as preventing the spread of bacteria and mold accumulation. If you have a home filled with noise sensitive people, then you cannot go wrong with the Elkay Schock. Its coating material naturally minimizes the sound produced from utensil clatter by absorbing the vibrations at its source. And for an even quieter time at the sink, the offset drain replacement provides more usable space on the bottom of the sink that minimizes noise even further. The twin bowls are extra-deep and with a higher capacity that offers more room inside it for stacking dishes, filling stockpots, and handling large baking sheets and roasters. When it comes to a quartz-based structure, the immediate downside comes from how cheap it looks. Even though resistant to scratch, stains and higher temperatures, the sink just feels like glorified plastic to the touch, thereby losing out on a lot of its aesthetic values. Additionally, due to the nature of its finish, wear and tear will be more apparent to the naked eye after long and extensive use. The Elkay Schock is perhaps one of the best ways of brightening up your kitchen space and impressing your guests. This sink with its wide range of colors, compliments your decor or contrasts with your countertop and makes a bold statement on every social occasion. Hope we were able to help you out today on all your kitchen hardware needs.